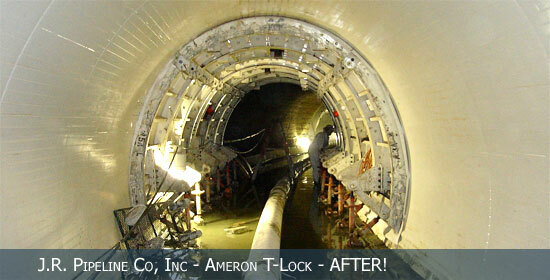 Rehabilitate the existing 2,282 lf of 105” Wood Street Interceptor sewer tunnel with Linabond Structural Polymer. East Bay Municipal Utility District (EBMUD) accepted the Engineering Achievement Award from the San Francisco Bay Section of the California Water Environment Association for the Wood Street Interceptor - Phase I. 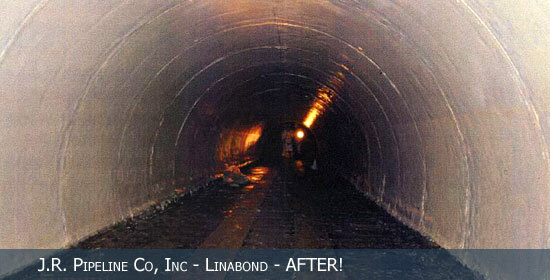 This pipeline rehabilitation project utilized the Linabond Structural Polymer Pipeline Co-Lining System. The scope included lining 270 degrees of a 105-in. pipe for a distance of 2300 feet, without bypassing the flow of wastewater. The contractor, J.R. Pipeline Company, Inc. located in Perris, CA, coordinated the successful installation of the project, including sub-contracting the surface preparation to Dave MacNeil at Mac & Mac Industrial Services Ltd. (Surrey, British Columbia). The contract allowed for 520 days, but the co-lining was completed in less than 75 hours over 40 nights. From start to finish, the entire project was completed in a few months. In just two projects, J.R. 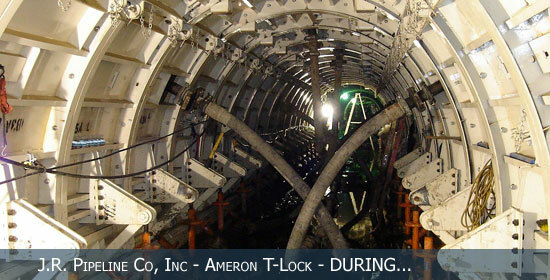 Pipeline and Mac & Mac has gained the reputation as the fastest, most efficient installation team of the Linabond Structural Polymer Pipeline Co-Lining System. Although many parties contributed to the success of the project, Elsabeth Girma of EBMUD, coordinated Oakland's dedication to current trenchless technology. She was integral in the specification development, pre-installation planning, project management and final approval. She worked hand-in-hand with the consulting engineers, the consulting project managers and the contractor to insure the success of the Wood Street installation. 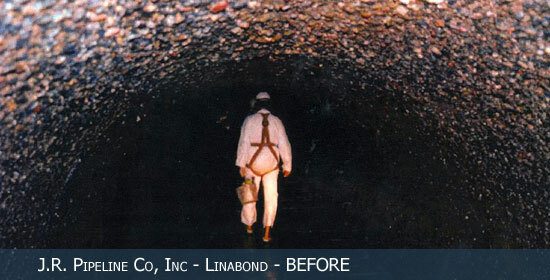 Developed more than a decade ago, the Linabond Structural Polymer Pipeline Co-Lining System extracts the maximum amount of strength and value from the existing pipe by creating a broad load transfer with strong, corrosion-proof materials. The existing pipe is salvaged and used as a component in the new composite structure. Pipelines can be structurally rehabilitated at a rate of a lineal foot per minute, with little disturbance to the surrounding community. No bypassing required. Linabond is fast, convenient and cost effective. 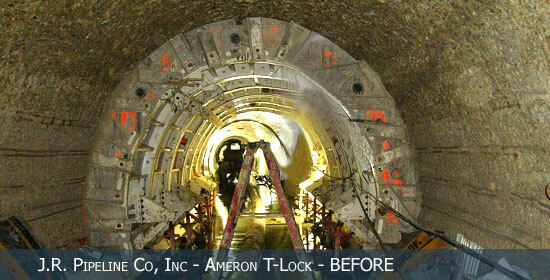 Rehabilitation of the existing 6,200 lf of 108” South Metro Sewer tunnel with Linabond Structural Polymer.